For the next week, Connecticut is expecting rain. And lots of it. I sat in front of the television trying to find a weather channel that had sunnier forecasts, but each disappointed me. And being a delivery girl for a local Asian restaurant means I have to drive in the rain. This will not end well. I know. I've done the math. Driving + Asian driver = Look out! Driving + Asian driver + rain = DANGER! Driving + Asian driver + rain + windy roads = AHHH STAY ON YOUR SIDE OF THE ROAD! Gas is now $4.30/gal. It's ridiculous. In fact, the day I came home, gas was $4.13/gal and the very next morning, it jumped up to $4.17/gal. It's really ridiculous. On another note, I made lamingtons again. This time, they came out better. We (Illia and I) had a more powerful mixer and we had more measuring spoons to work with. Last time, I only had one one-cup and one one-tablespoon. I had to be creative, which resulted in the cake base collapsing. It was still delicious. So much deliciousness in one little square. I bring this up yet again because my favorite YouTube vlogger Natalie Tran, more universally known as communitychannel, had once promised lamingtons to her viewers. She never delivered. Now, you may think I'm insane for following a vlogger with the intensity I have, but watch some of her videos (these are some of my favorites...probably because I relate to them the most: JUST KEEP IT, BAD LOSER, Embrace The Position, OMG you look SO hot, Cooking in a hotel room with Natalie Tran). Coming soon to theaters, I believe. Anyway, I love movies like this. They make me want to be a teacher, to be an inspiration to someone and help them find who they are. I want to help people realize their potential and help them to overcome moments of self-doubt. (I realize I also have self-doubts and have to overcome my own faults, but I have been working on fixing many since I've been home and unemployed.) I want people to be happy because if there is one thing in this world that I believe all of the human race is entitled to is true happiness. Holy cow, I love this song (which made my Favorite Songs for the Time Being (to the right of my posts under About Me)). I bought Elbow's The Seldom Seen Kid (2008) and it's absolutely wonderful. I listened to the album all the way through for the first time when I was caravaning with a friend. (She was dropping off her car and I was to drive her back home.) The only qualm I had with the album was its first song "Starlings": I was driving and trying to find my exit when "Starlings" was playing. At various points of the song, there were horns, as in brass instruments, blaring from my car's six speakers for a good two measures each. I became disoriented and deaf and I had missed my exit. But, when "One Day Like This" filled my Honda with wonderful strings and beautiful lyrics, the next six minutes and fifty-one seconds were just pure happiness. I couldn't help but smile when Guy Garvey confessed that he loved my eyes. Oh goodness. I have a weakness for strings and accents. i love you. and natalie tran. 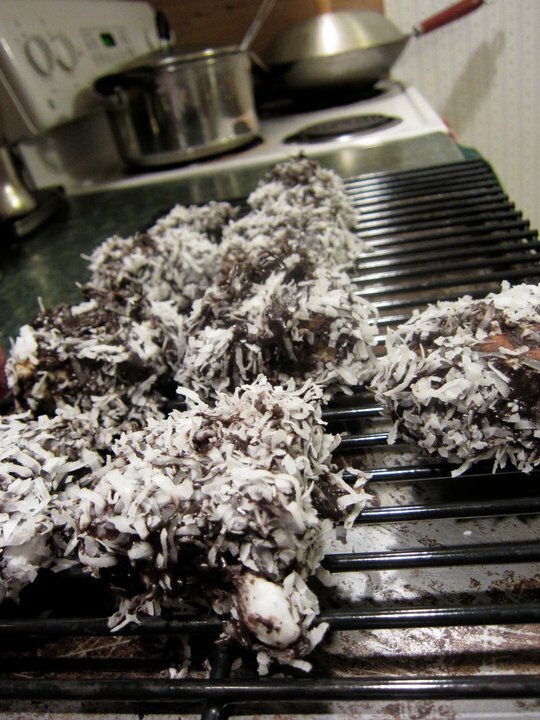 and lamingtons. actually, i haven't had lamingtons yet. YET. Wow, I just realized that you commented on this post like...twelve days ago. I love YOU. 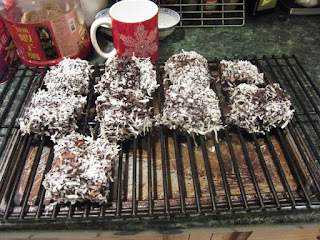 And I look forward to this fall when we will make tons of lamingtons.